If you’re looking for an extremely versatile window option, look no further than double hung windows. With two operable sashes, they offer many awesome benefits that help them stand out from other window styles. Double hung windows are the most popular window style for a multitude of reasons. One of the most obvious is because of their versatility. There isn’t a room in your home that wouldn’t benefit from the installation of a double hung window. They also work well with other windows. They can be paired with other operable windows, inoperable windows or even other double hung windows. 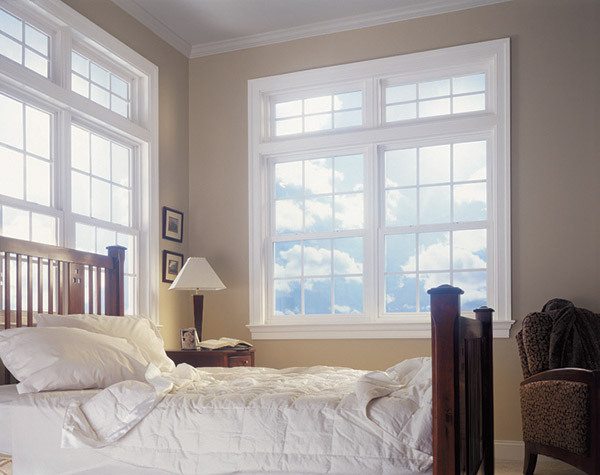 The sky is the limit when you’re working with double hung windows. As we’ve already mentioned, double hung windows have two operating sashes – one on the top and the other on the bottom. This gives you great control over how much air you’re letting into your home. Much like casement windows, you can clean both sides of a double hung window from the comfort of your home – no more getting on a ladder to reach the other side. Feldco double hung windows have tilt latches located on the top of both sashes. When they’re compressed, the sash will tilt into your home. This allows you to scrub both sides easily. A feature that’s exclusive to Feldco windows are the child safety latches. These are little latches that are found at 3 and 5 inches on the surface of the frame. These latches have one major purpose – to prevent your windows from opening too far. This allows you to open your double hung window and enjoy fresh air without the fear of your children or pets sneaking out of your home. It’s very important that your double hung window is installed properly. Feldco makes the entire replacement window process easier by having factory trained and certified professionals install your window. Get a free quote now so you can rest easy knowing your replacement window project is in good hands.